A Visitor Who Was Not Very Flattering! My cousin Mohan, just a couple of years younger than I am, came up to Pune to spend two days with me on Friday and Saturday. And there is a rather interesting story behind that visit. Before we reconnected three years ago, I had not met or even been aware of what all had happened to Mohan since 1958. Another cousin, naturally cousin to Mohan too, however had been and used my visit to Chennai four years ago to get the two of us together after more than half a century. Since then both Mohan and I have been in touch regularly and I had even spent a few days as Mohan’s house guest three years ago in Chennai. Neither during that stay at his home, nor during the other times that I had met him in Chennai, were we able to spend some time alone together to talk in detail about all that had happened to us between our school days and now. I had left Chennai for other places and never returned to live there, whereas Mohan had not lived anywhere else except to go for training and employment in the UK for a few years in his youth. This trip was to remedy the situation as nobody would be around and we had nothing to do other than talk and catch up with each other. And that is exactly what we did and oohed and aahed at our various experiences. 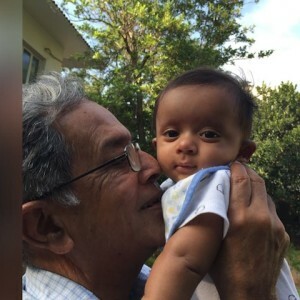 On the left is Mohan with his grandson Arjun who is now 8 months old. Mohan’s wife Sheila and daughter / Arjun’s aunt Divya are right now in the USA with Arjun and that is how Mohan was able to get away from Chennai. Having got that little background out of the way, let me share all that happened during these two days. I received Mohan at the airport and drove him home and then subsequently to his hotel just a little over a kilometer away from my place. I brought him back after his siesta to my home, but I was lucky to find an autorickshaw to send him back there after dinner. During the day however, Mohan diplomatically kept telling me to hire a cab with a driver for Saturday showing concern for my having to drive in the traffic of Pune, while actually hiding his fear of being a passenger in a vehicle driven by me. I obliged and on Saturday we hired a car to take us around till late in the evening when I had to again drive him out for an early dinner and back to his hotel. He gallantly offered to order for a cab early morning today to take him to the airport and again hid his real motive by suggesting that I should not wake up at some unearthly hour just because he had to catch an early morning flight. Be that as it may, he has gone back and I was spared the early morning chauffeur duty. On Friday, matters were well under control with lunch at home and dinner at my favourite neighbourhood restaurant. On Saturday, I had taken Mohan to Sangameshwar, Tulapur little knowing that on Saturdays he visits a temple and observes a discipline of not having any alcoholic drink and eating only vegetarian food. He had a wonderful darshan of the swayambhu had some kanda bajji and we returned to Pune by lunch time. Since it was a vegetarian food day for him he desired that we go for a Gujarati Thali lunch and the next adventure started. All the restaurants that I knew that offered this speciality had closed down between the time I used to know of their existence and now. In the last mall where we had gone to and were disappointed, Mohan found a small cafeteria offering some vegetarian food and we settled for that. We then decided to dispense off with the hired car and driver as we did not expect to go anywhere far away for dinner. For dinner, Mohan desired to have some varieties of chaat. The idea was to have it at a restaurant very near my home and then for Mohan to go back to his hotel in a rickshaw. When we landed up at the chaat shop we were informed that they had changed the cuisine on offer and chaat was no longer available. So, much to his chagrin I had to drive him a couple of Kms to another chaat place but what he had there offset his fear of my driving skills. I left him at the hotel and offered to drop him off at the airport this morning but you know what happened already! He is safely back at Chennai and no doubt saying ‘phew’ to himself, everytime he recalls being driven around by me. This entry was posted in Family, Food, Humor and tagged Chaat, Gujarathi Thali, Sangameshwar, Swayambhu, Tulapur. Bookmark the permalink. 18 Responses to A Visitor Who Was Not Very Flattering! What a sweet, funny story. 🙂 Don’t feel bad. I only drive around our little town, poor Andy has to do the driving off the hill. Years ago he made the mistake of seriously criticizing a woman driver as we were going to Santa Fe. (He was doing the driving.) I said who knows what handicaps she was dealing with, maybe her eyes were as bad as mine. From now on we’ll be responsible people and take me off the road, you will do the driving. (Our public transportation isn’t nearly as good as yours.) It’s only sensible to know our limitations and focus on the things we do well. I’m glad you had a good visit with Mohan! Cheerful Monk recently posted..Good for These Muslims! I don’t feel bad at all! Most of my rant is just teasing Mohan for showing such consideration. Neither Mohan nor I gave any advice to the other! We simply shared information and sympathised/condoled with each other. Yes, it was a very good visit. Sigh! I was hoping you were a kindred spirit. I am glad you had such a good visit. Cheerful Monk recently posted..Why Did It Take So Long? No such luck CM. But, rest assured, I increasingly eschew driving. What with digital taxi and autorickshaw services available round the clock, it is better that I don’t bash my head with morons and parking lot problems. Did you project what you thought he was thinking? It may not be the truth at all!! I am just teasing him WWW. He was just being considerate. My first car, a Monday production, I’m sure, had crossed electric- turn on the lights, and the wipers went on. My friends preferred to take the bus to riding with me. Alas, our bus days are over! I would like to go in them but am forbidden by the son and heir from even thinking about it. I am puzzled by your driving skills. Are they so bad or is Mohan very sensitive or you very self-critical? It makes a fun story in any case. The links to the Indian specialties are very educating and enticing. Even if Sydney has good Indian restaurants, I think that Mohan would have real difficulties to observe his spiritual routine. I found his routine interesting and worth to follow in some modified way. I believe that it is good for the body to give it digestive rest regularly. I am a very good driver Anna. I am just teasing Mohan because he was being very considerate to me. Pune’s traffic is mind boggling for people coming from more disciplined places and he did not want me to be stressed out! i hope he reads your blog. i could almost hear the traffic and smell the food in this post. He and his delightful daughter regularly read all my posts and I am sure that this one will be read by his lovely wife too. I made it a point to send her a link by email. What a great tale of the meeting up of old friends. And since another very important family matter is a work in progress, we are in touch almost every three hours. You are right. Mohan reads my blogs and I was just teasing him. I am quite a good and safe driver! When Ramana talks of 1958 Meeting, he is being very modest. It was a life-saving event for me. Since you are all fans (acolytes?) of Ramana like me, hopefully you will allow me to digress a bit. I vividly remember that September, 1958 day. I was in 3rd Form (Class 8) in MCCS, Harrington Road, Chetpet, Chennai. Our mid-term exams, which runs from Thursday to Saturday were going on. Through no fault of mine, on the first day of the exam, I was involved in a fisticuff with a larger classmate, who came out worse. There was gang of class toughies who were his friends – I still remember their names – Kulbhushan, Ajit, Dilip, Nataraj and 3 others – they were so stupid that they used to smoke in F4 football field, which was far off from the school building. These chaps got to together to tell me that they were going to make me pay for assault of their friend on the last day, which was Saturday. I had 3 days to sweat and worry about my dreadful fate. They used to remind me twice a day how they were going to wrench my arm off my shoulder, re-arrange my face..etc. Even now I wonder how I held my nerves and passed my mid-term papers. On the appointed day, I walked out of the school gate sweating, expecting the worst. The road seemed clear until I reached a large Tamarind tree, when a crowd of boys came from behind the tree and surrounded me. They were all telling me what each of them was going to do me. At this point, a cycle pulled up next to me and I was relieved to find Ramana’s younger brother Arvind standing next to me, offering to take me ‘doubles’ at the back to my home. Then Bharat and Ramana pulled up as well on their cycles. I was about to explain my predicament to my Saviours but when I looked around, there were only 4 of us ! My Class toughies just vanished into thin air. If they were stupid to smoke in Class 8, they must have been imbeciles not to know I was the School Toughie, Ramana’s cousin !!. About Pune’s traffic, I am not faint-hearted, coming as I am from Chennai but was petrified by Pune traffic, which is like Russian Roulette with several loaded bullets – the person with the strongest nerve and the most-damaged vehicle had right of way. Besides, none of the traffic signals were working, not sure if the Phalki on that day magically turned them off to ease the procession. If this was not enough, Ramana confided that he used to be a Rally driver with souped-up car in his younger and attempted to revive his long lost driving skills. So my heart was in my mouth most of the day. It was a spark of genius on my part to suggest the hiring of a taxi for the next day. Since this is my visit to Pune after a lapse of 10 or so years, Ramana made it a memorable one. Thanks a lot, Ramana ! Okay, point made. Please come again and I will keep a hired car from the time of your arrival till you leave. We will do other things that we were not able to due to the Palki, the next time.